Lightroom 8.0 is an unusual release in so far as it’s the first full update that doesn’t include many major new features. Furthermore, and unlike every previous full version update, it doesn’t upgrade your catalog. So, rolling back to any version between 7.0 and 7.5 is relatively straightforward. As implied above, new features and enhancements won’t jump out at you. In fact, some may be of little, if any use to a sizeable number of Lightroom users. OK, so here’s an example of a new feature that Adobe will make a big deal off, yet it’s only available to customers capturing photos with Apple iPhones such as the 7 plus, 8 plus, X and later when using portrait mode with the built-in camera. The files must also have been captured be using the HEIC file format. 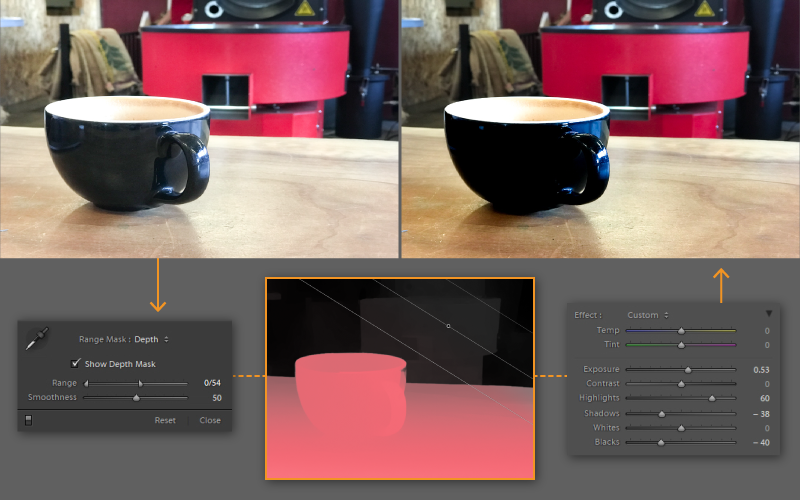 Depth Range Mask works in a similar way to Luminance Range Mask (has range and smoothness sliders) present in local adjustments tools (i.e. brush, graduated filter and radial filter). However, instead of the selection being based on a range of Luminance values, it selects based on a range of depth values. You can also use the eye dropper tool to sample a point or an area. The “Show Range Mask” checkbox allows you to view the depth map of the image in black and white representation as demonstrated in below example. Image courtesy of Adobe Inc.
Red denotes the actual area masked which is an intersection of depth and local adjustment applied. A similar feature has also been added to Luminance Range Mask. 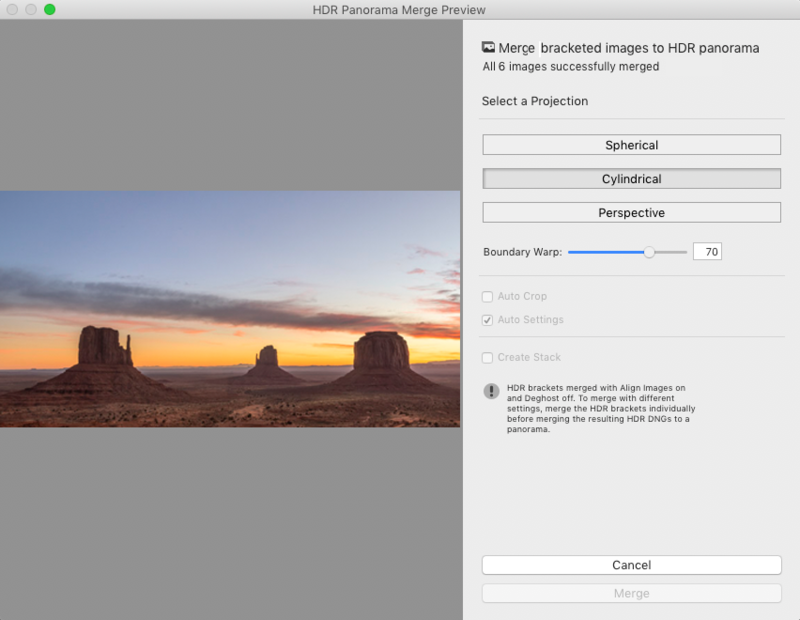 The Single Step HDR Panorama feature will allow you to select a sequence of exposure brackets and merge them to an HDR Panorama in a single step. You can also now select the shutter speed, aperture, ISO and white balance from the Tether control bar. Over time we can expect to see similar enhancements being added for Nikon and other camera vendors. 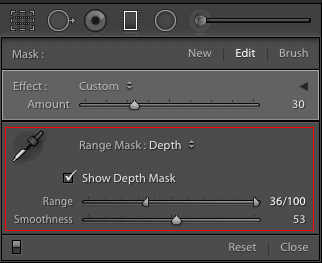 Improved Negative DehazeThis update improves the usability of the minus/left range (from 0) of the Dehaze slider, making it much more perceptually uniform, and providing a more useful range, especially for HDR images. Improvements to image quality behaviour for high ISO raw filesThe improvements manifest as reduced purple/magenta color cast in the shadows, and improved shadow detail. Adobe have updated have the Video library for Lightroom Classic 8.0. This will impact any workflow related to Videos and all of Slideshow module. In addition, AVI movie files are no longer supported on macOS. Beginning with this release, Lightroom Classic supports Apple’s HEVC video format (High Efficiency Video Coding, also known as H.265) on macOS High Sierra v10.13 or later. For further information, see HEIC and HEVC media files support in Lightroom and Camera Raw. macOS 10.14 Mojave is officially supported in this release. If you use Windows 10, you’ll need version 1703 or later. This entry was posted in Depth Range Masking, HEVC Files, Lightroom Classic, Tethering for Canon camera. Bookmark the permalink.